Marketing Strategy Musings - Strategy Dude (Edmund Wong's blog): Where is Twitter on the Hype Cycle? Where is Twitter on the Hype Cycle? 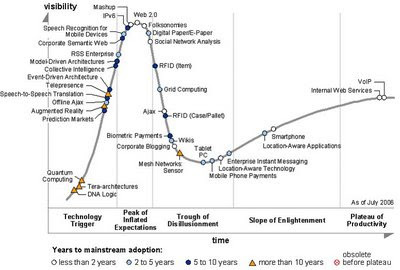 I love the Hype Cycle curve developed by Gartner. It kinda reminds me of Geoffrey Moore's Crossing the Chasm in the sense that many companies, especially tech, never manage to go mainstream...in other words, they fail to cross the chasm. This hype cycle is related because some technologies, like Twitter, are over-hyped and fail to go mainstream and, more importantly, make $$$! Where will Twitter end up? Edmund - thanks for the kind words about the Gartner Hype cycle. I have mentioned in our own blog that it's probably better to think of the technology passing through the cycle rather than one company. Set your thinking at that level and you start asking questions like how many others will copy Twitter to take a share of the market, when will that consolidate, and how will this technology integrate with others to deliver a financial return? 'Microblogging' is here to stay and will make it all the way through the cycle. Twitter might or might not continue to dominate that. For interesting examples from history - consider the recent fate of Geocities or the history of Altavista ... vs the fate of small / personal websites and crawler based web search. Goof points, Mark. Microblogging is here to stay cuz it's so convenient. Twitter will likely face more formidable competitors, similar to how IM evolved with Y! and Microsoft after ICQ and AIM. In fact, IM companies may integrate microblogging features. Might as well add Friendster to the list of historical roadkill.